Wherever there is a Hollywood sci-fi or horror movie blockbuster, there is usually at least one shameless low budget cash-in lurking somewhere in the wings. Nowadays we have the likes of the Asylum Studio and Transmorphers, but back in the 1970s and 80s, it was often an Italian film producer turning out some product or marketing campaign superficially similar to the latest hit and Contamination is a perfect example of this. 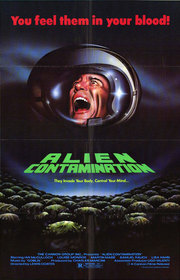 It was sold as a clone of Alien, and although they both share some roots in 1950s sci-fi moviesi, unlike Ridley Scott's film, Contamination fails to expand much on the template, making for a bloody but boring viewing experience. A ship drifts into New York harbor, laden with mysterious green glowing eggs and the mutilated bodies of the crew. Government agent Colonel Stella Holmes teams up with NYPD Detective Tony Aris to investigate, and they soon establish a link between the ship and a recent mission to Mars that ended with one of the two man crew disappearing and the other, Ian Hubbard (played by Ian McCulloch of Zombi 2 fame), turning into a broken down alcoholic. However, is the missing man actually still alive and well? 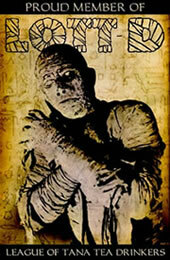 Moreover, is he at the center of a plot to wipe out humanity? The result is, not surprisingly, a bit of a mess, and this is reflected in the central premise, which not only fails to take on board the logic behind the ideas it is stealing, it also fails to create an internal logic of its own. The eggs, instead of being the first stage in a parasitic life cycle, as in Alien, just seem to explode and spray acidic slime on people, who then swell and explode themselves. So quite why the invaders need to go to the elaborate lengths of setting up a fake South American coffee factory in order to ship the eggs around the world and leave them in sewers is never explained - why not just dump a load in a few major cities, wipe everybody out and then move in? Confusion and half thought through ideas abound. For example, it is never clear exactly what part of the US Government Colonel Stella Holmes works for. Phrases such as "Emergency Plan 7", "Internal Services Special Division 5" and "Special Section, Squad 2" are thrown about and then quickly forgotten. In addition, Hubbard's alcoholism is mentioned once, illustrated by showing a few empty beer cans in his apartment, and then quickly discarded, which is a shame, as his battle with the bottle paralleled with his battle with the aliens could have been an interesting piece of character development. In fact, any kind of character development would have been welcome. Aris, Hubbard and Holmes are straight out of a 50s Sci-Fi B-Movie template - two square jawed macho men who won't let the imminent destruction of mankind spoil their dating chances, and a woman who starts off being as tough and strong as the men, but soon degenerates into somebody who screams a lot and needs to be rescued. Barely one dimensional, all three fail to arouse any strong feelings either positive or negative, and when one dies unexpectedly, there is no big emotional response from the characters or the viewer. Poor directing choices compound the poor writing, such as in the scene where Colonel Holmes is trapped in a room with an about-to-explode alien egg. This sequence could have been tightly paced and suspenseful, using editing and music to ramp up the anxiety bit by bit. Instead, it drags on, any tension built up being quickly deflated by cutting back to long scenes of Hubbard and Aris making phone calls and deciding where to have dinner. Given the rushed and cheap nature of the production it is no surprise that the special effects are not of a high standard. Most of the eggs look like painted balloons and the exploding chest effect is plainly somebody with something inflatable strapped to their stomach. The nadir comes when we finally see the main alien, which, in keeping with the 50s B-Movie theme, is extremely reminiscent of the "ice cream cone" creature from Corman's It Conquered the World, and just as silly. Here at least, Cozzi makes one good directing decision, by choosing to show the monster as little as possible. The one major thing that Contamination does have in its favor is the excellent score, by Italian soundtrack regulars (and, like Cozzi, frequent Dario Argento collaborators) Goblin. Although only consisting of a few themes that are repeated at several points throughout the film, these switch smoothly between eerie synthesizer driven minimalism, tense funk and noisy bombast, and, they give something of a sense of tension and adrenaline to scenes that would otherwise fall flat. Unfortunately, this alone is not enough to save the film. Read or watch any interview with Luigi Cozzi and his knowledge of, and love for cinema, particularly sci-fi and horror, is obvious and genuine, as is his joy at being able to make those kinds of filmsiii. However, in the case of Contamination, enthusiasm vastly outstrips talent, leaving a clumsy, muddled and ultimately very dull film.